If given the choice, would you rather receive an object type gift for your birthday or Christmas—or an activity, gathering, adventure-type gift for the same? Do you like, need, and collect things (useful or not) —or do you crave experiences? If you are married, you are likely married to the opposite of you in this department. At least I am. Give my husband a new tool or even a new flannel shirt or jacket and he’s gonna be happy. I am just as happy with going to a concert, eating out, a trip, or adventure. Ultimately, both of us are quite happy with any kind of gift or remembrance. 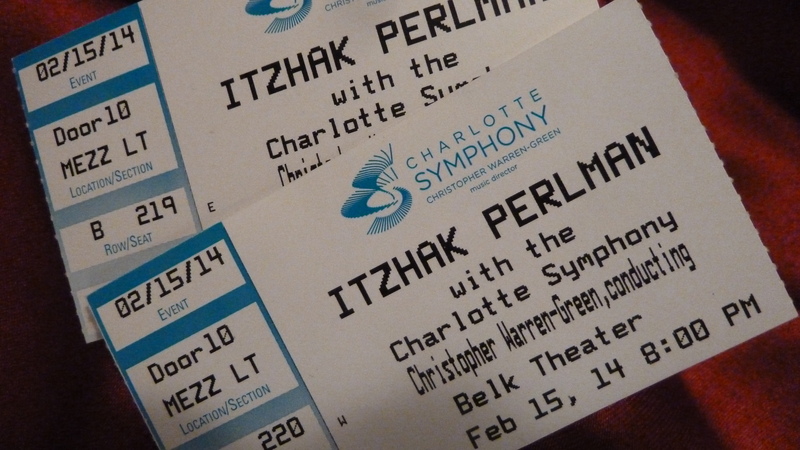 Hearing Perlman live in concert was truly as virtuoso and marvelous as I could have wanted, a bucket list event, for me. I believe I’ve heard of Perlman most of my life, who first appeared in the U.S. on the Ed Sullivan show in the late 50s as an 11 year old child, with his polio crutches. Not that I saw him then, we didn’t have TV. So that little subtext had escaped my notice all these years in just hearing conversation about him. In fact my daughter, who has twice helped to host him as a guest artist in two cities, never mentioned polio. To her credit. Why mention a little thing like motor issues with legs and feet when you can make a violin talk like Itzhak Perlman? The strains from his strings pierced my inner spirit in a spine-tingling way. 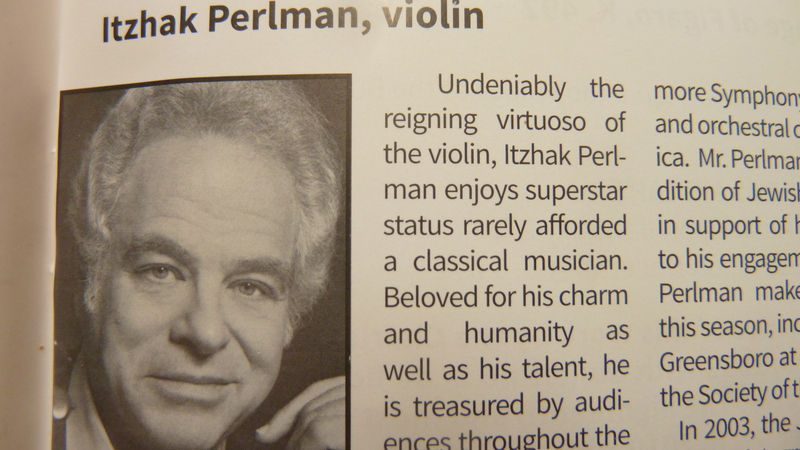 You can read much more about Perlman at his website, including the fact that it was Perlman who played the haunting violin solos in the Academy Award winning Steven Spielberg movie, Schindler’s List. You may also remember seeing him play at President Obama’s first inauguration in bitterly cold weather. The Charlotte Observer gave a beautiful review of the performance we saw (here) playing Felix Mendelssohn’s “Violin Concerto in E Minor” so I’ll not repeat that. What I personally loved though was watching the showmanship of Christopher Warren-Green, the orchestra’s usual conductor in absolute command during the first half of the concert when Perlman was not soloing, complete with gloriously wavy white hair blazing like Leonard Bernstein. And then, like an ambassador or vice-president standing aside in deference to a queen or a president, Warren-Green graciously turned aside from the limelight as he “allowed” Perlman to basically conduct the second half of the concert. Every now and then Perlman would glance up like a little boy at Warren-Green as if to say “Oh, yes, I’m supposed to be following a conductor here, oops.” But it was Perlman romancing his sweet little Stradivarius as Warren-Green and the symphony orchestra followed along. 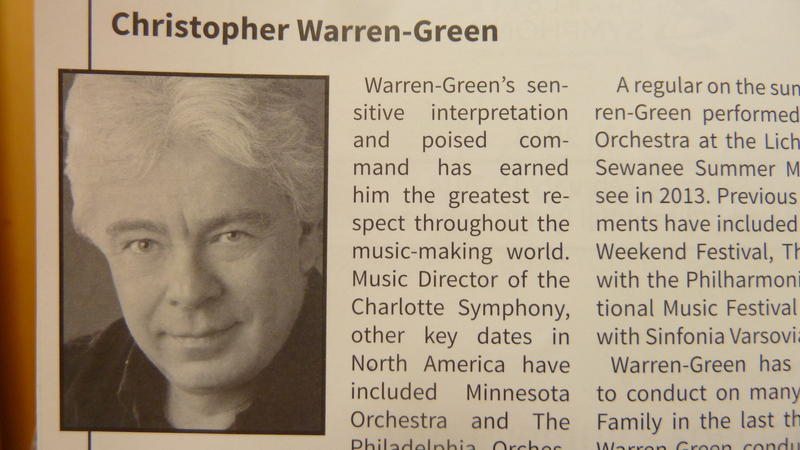 British born Warren-Green, if you’ve forgotten, is no stranger to royalty himself, having conducted an orchestra for the 2011 wedding of Prince William and Kate (now Duke and Duchess of Cambridge) at Westminster Abbey, and other royal events over the Big Pond. It’s always fun to be in the presence of people you’ve heard of for a long time but never thought you’d hear/see in person. My daughter was too smart to let us go gaga over the stars so we toured backstage without seeing either Warren-Green or Perlman, but it was marvelous just the same. We didn’t want to be like groupies, heaven forbid. And what a birthday-Valentine’s treat I will treasure a long time. Thanks, kids. Do you like experiences or events over gifts? I’d love to hear your favorite adventure or experience given or received as a gift. What a lovely treat for you and I am sure it is a memory that you will treasure for a long time to come. You betcha. I always regret that I can’t take pictures at concerts so I make word pictures so I’ll remember details! Thanks for the comment.